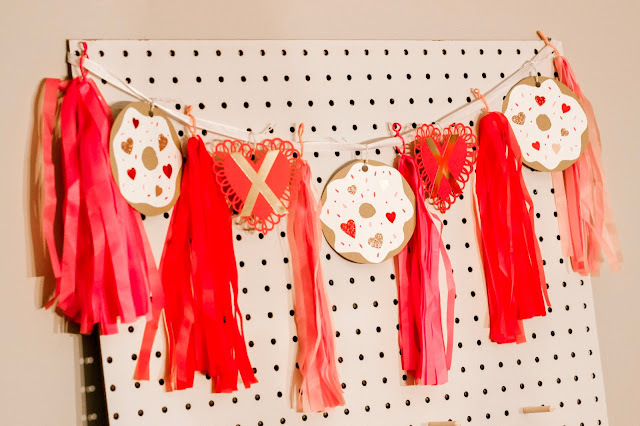 When I started planning Isla's first birthday party, I knew I wanted to do a brunch and with her birthday being so close to Valentine's Day, I wanted to incorporate all the sweet Valentine's Day touches as well! I of course started pinning on Pinterest and LOVED the idea of having a donut wall as part of our decor. I love a good DIY, but with three little ladies running around, I was worried I wouldn't have the time, or let's be honest, energy to pull this one off! 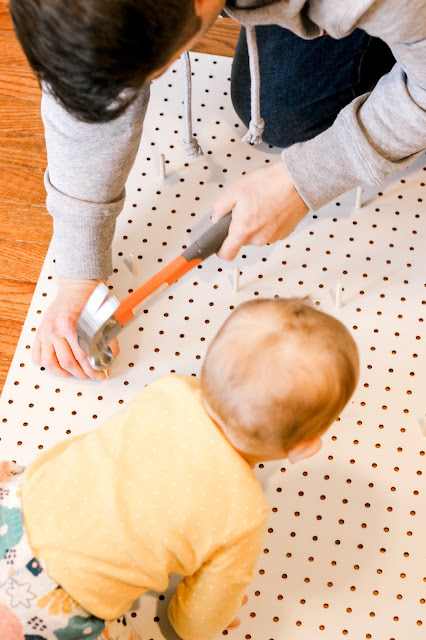 Well, let me tell you, this was the EASIEST and cutest DIY project ever! 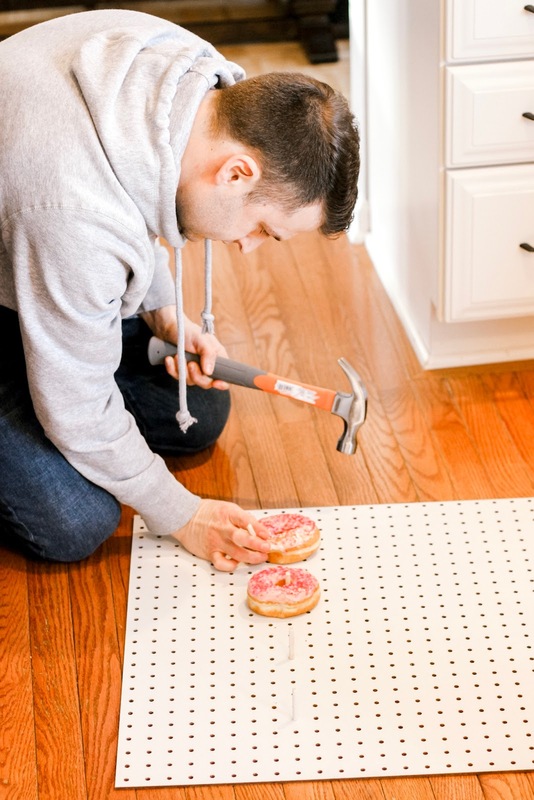 All you need is a peg board, wood pegs or one large wood rod to cut, donuts and a cute side kick to help with quality control. 1. 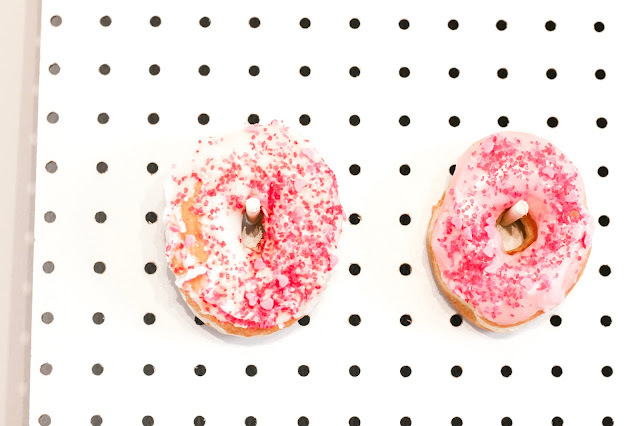 First, decide how many donuts you want on the wall, we decided to have five rows of four donuts, with extra space left at the top of decor. 2. Next, lightly hammer, really tap, each wood peg into the wall. 4. Finally, take a donut off the wall and eat it, really, seriously, that's it... see, SO easy and SO quick! I also made a quick and easy DIY for the garland on both the donut wall and Miss Birthday girl's high chair! I found the tassel garland in the Target dollar spot and added the "xoxo" hearts and donuts on my own! 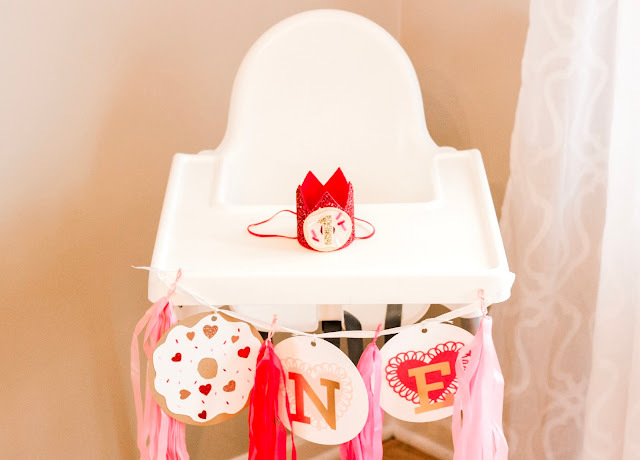 I started by tracing a circle shape on craft paper, another set of white circles for the frosting, stickers for the sprinkles and used letter stickers on heart dollies for my "x"s. Add a quick hole punch to the top and secured them to my tassel garland with string and ta-da an easy and adorable garland! 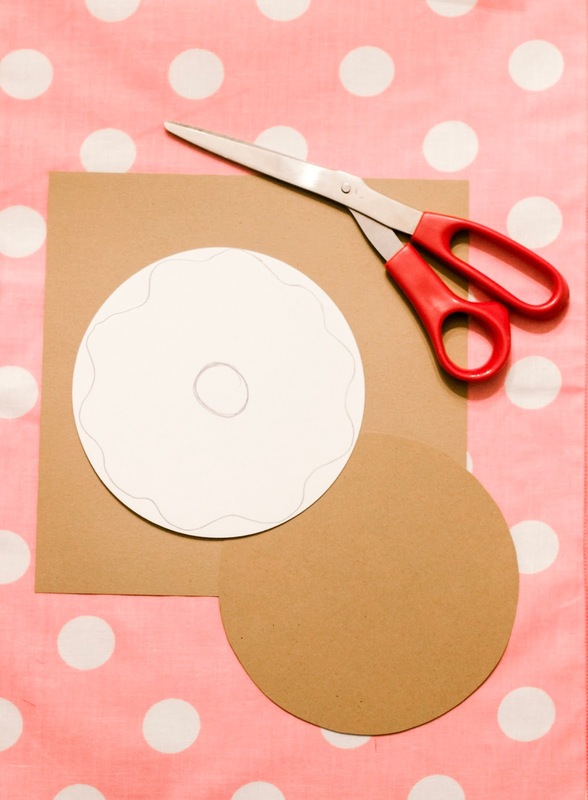 What are your tips and tricks for simple DIY projects that make a big impact for your parties? 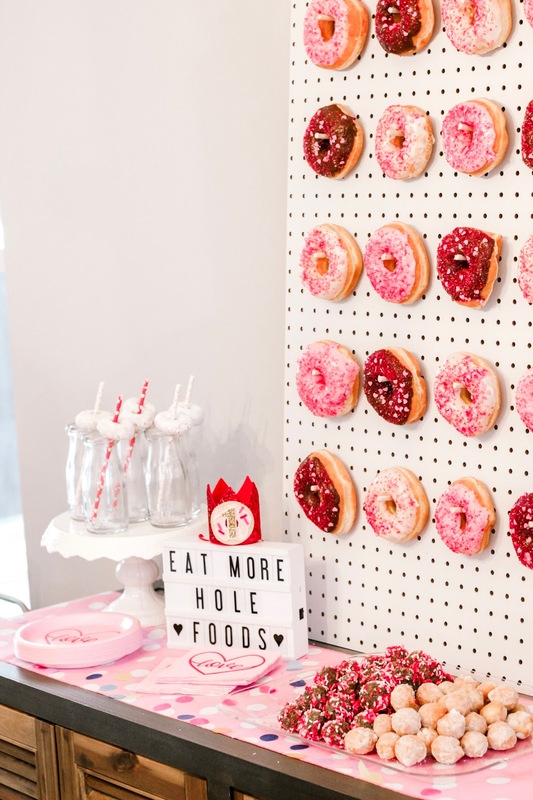 I can't wait to use this donut wall again and I am more then happy to loan it out to any of you local Mama's. Now excuse me while I go enjoy one of those leftover donuts, Happy Tuesday! Don't forget to follow along with our daily adventures on Instagram and for more decor inspiration, make sure to follow me on Pinterest! This is amazing!! 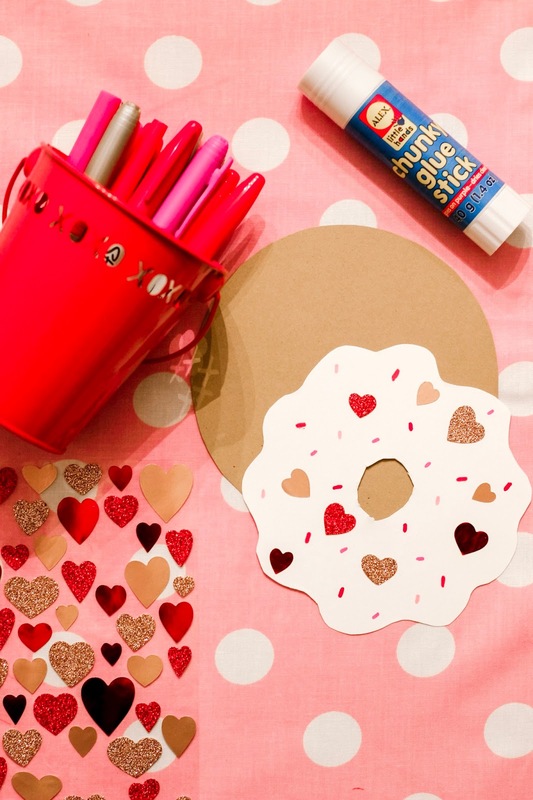 Both of my kids love donuts so you've got me thinking about donuts for their Spring parties. This project sounds so doable. Thanks for the directions. Thank you! 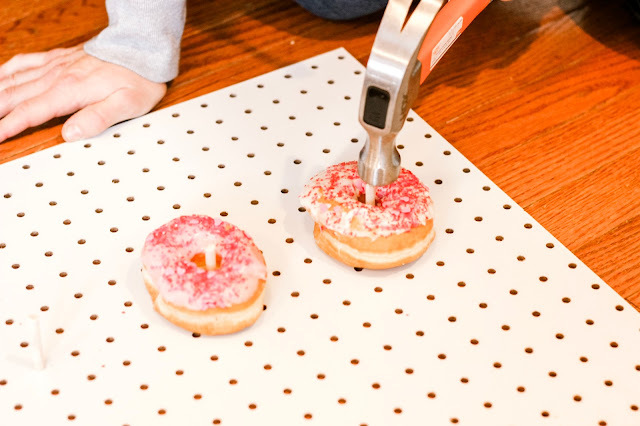 It was SO easy and such a hit at the party, we can't wait to use it for future parties too, in fact I kind of wish I could keep it up with fresh donuts all the time! Thanks Jennifer- it was such a quick, fun, cheap and easy DIY! I can't wait to use it again, it was a hit with our guests too!